Discussion in 'Flower Gardening' started by Clay_22, Aug 5, 2014. Glad that the Gladiolus that was planted by bulb this spring by my two girls Taylor & Jessica are all growing and starting to bloom. They were both happy & excited to see their work has grown so well. Frank, eclecticgarden, purpleinopp and 8 others like this. carolyn and purpleinopp like this. Those are so pretty. Happy for the girls that their work was rewarded so well in these beautiful flowers. 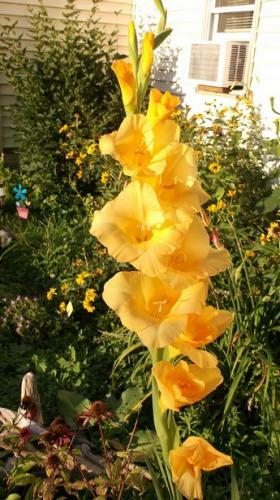 I especially like the yellow gladiolus. 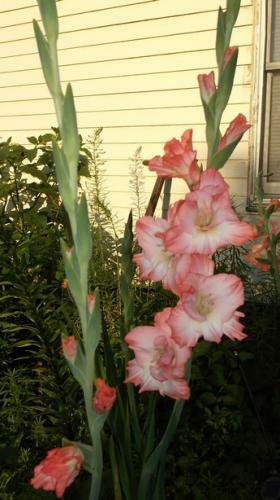 I know one gentleman planted his gladiolus near his coral type fence and tied the flower stems to the fence.